If Woodrow Wilson was alive today, it’s a safe bet he’d raise a glass of his hallmark “Wilson Whiskey” to the 20+ national parks that currently ban the sale of bottled water on park land. When Wilson signed the act establishing the National Park Service (NPS) in 1916, it put in place a mechanism for preserving millions of acres of land and natural resources at a time when society’s wants, needs and habits were beginning to drastically change from generation to generation. Now, the NPS has harnessed their ability to “evolve with the times” to help reduce the single-largest contributor to trash (one-third of all trash dumped) in parks: plastic water bottles. Twenty-three National Parks now ban the sale of plastic water bottles in an effort to reduce litter on the ground and in waste streams, as well as to reduce the carbon footprint associated with their locations. As far as reducing waste and keeping park sites more pleasant, healthy and safe for visitors – of the human, animal, fish and avian varieties – the bans are working. Zion National Park in Utah, for example, estimates that one year of the bottle ban prevented more than 60,000 water bottles from entering its waste stream. In terms of carbon footprint, consider this: approximately 292.8 million people visit National Parks annually. If each one of those visitors utilized just one disposable plastic water bottle, the production of those bottles will consume approximately 290 million barrels of oil and release 145 million tons of greenhouse gases. However, if the group of National Parks currently enforcing a plastic water bottle ban resulted in the elimination of one bottle per visitor, oil consumption and greenhouse gas emissions could be reduced by an estimated 40% (or, a reduction of 116 barrels of oil and 385 million tons of gases). Moreover, the National Parks with the ban are providing alternatives to bottled water that truly uphold the spirit of visiting and appreciating these area – free and readily available natural spring water for filling up reusable bottles! 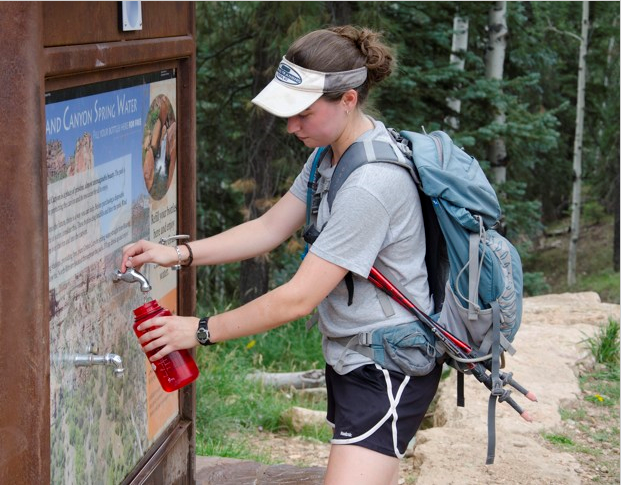 Grand Canyon National Park’s “Reduce, Reuse, Refill!” initiative offers a great example of how many parks are selling reusable water bottles and peppering their sites with refilling stations. Finally, it’s worth recognizing some reasons why the NPS is not simply issuing an across-the-board ban in all National Parks but instead encourage the ban on a park-by-park basis. First, they are doing it out of responsibility to the people they serve. Some parks simply do not have sufficient running water resources to assure the proper hydration for visitors. Secondly, there are a fair share of dissenters, mostly industry lobbyists looking to protect the $8+ billion bottle water industry. So, as the National Park Service approaches its centennial this January, let’s raise a glass – of, not Wilson Whiskey, but wonderful tap water to the many people working to maintain the founding mission of the Service with solutions for today’s society.